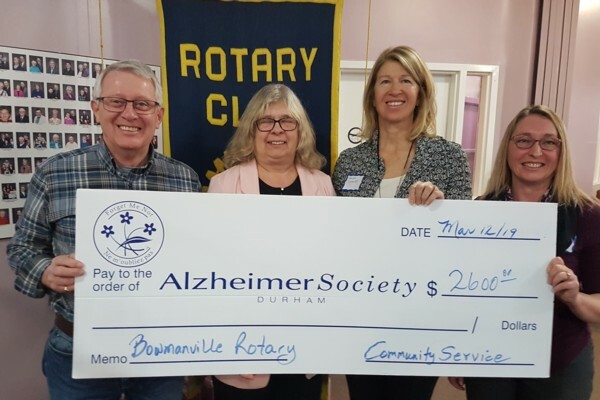 For the past few years the Alzheimer Society Durham Region has provided a support program at the Bowmanville Older Adult Centre called Minds in Motion. Minds in Motion is a physical activity and brain stimulation program for people with dementia and their care givers. The program was originally funded through a Trillium grant which has now expired. The Rotary Club of Bowmanville was pleased to provide a grant of $2,600 to support the offering of two eight-week sessions. Our thanks to the Alzheimer Society Durham Region and the BOAA for this opportunity to support our community.